Project Management is a constantly changing profession. As a PMI Certified professional you are expected to keep yourself up to date. PMI measures your learning it form of Professional development units or PDUs. Every professional needs to renew their PMI certificate and report these PDUs to PMI every three years. This blog is a comprehensive guide to earn PDUs for CCR (Continuing Certification Requirements) of your PMI’s certificate. The question is How PDUs helps in maintaining the PMIs certificate? After you have cleared your PMI Certificate you can immediately start learning and keep your CCRS updated with new PDUs. Do note that, you need to earn PDUs within the CCR cycle to continue your PMI certificate. Earning PDUs ensures that you are up-to-date, competent, and relevant within domains of your certificate. The goal of PMI is to make sure that you are always prepared to meet the demands of your profession. For example, if you are PMP® certified you need to earn Sixty PDUs within the period of three years. Here three years represent the CCR cycle of your PMP® certificate. Let’s move to the details of various activities help in earning PDUs. As a professional you may have different interest and desires in advancing your career. Thus PMI introduced many ways to earn Your PDUs. You may decide on activities and take part in them to earn PDUs. Second, Giving Back to the Profession. These five categories need to be aligned with the PMI Talent Triangle. Education includes activities in the Technical, Leadership, and Strategic areas of Talent Triangle. Before moving into the details of these activities, let’s first explore the minimum and maximum PDUs requirements for each category. This information will help you to decide activities in earning PDUs. Here, one of the interesting points to note that PMI did not constrain the minimum PDUs requirements with ‘Giving Back to Profession’. Thus, PDUs from ‘Giving Back’ to the profession is optional. You need to earn at least Thirty-Five PDUs from the Education Category. Thus the maximum allowed PDUs from ‘Giving Back to Profession’ are Twenty-Five (60-35 = 25). You have to earn at least Eight PDUs for ‘Leadership’, ‘Technical’ and ‘Strategic’ categories of Talent Triangle. You can earn remaining 11 (35 – (8 Leadership + 8 Technical + 8 Strategic)) across any area of the Talent Triangle. If you choose to earn PDUs from “Work as a Practitioner” from the ‘Giving Back to the Profession”, you can earn a maximum of eight in one CCR cycle. You can choose to earn all sixty PDUs from any category of Education. You need to earn at least Eighteen PDUs from the Education Category. Thus the maximum allowed PDUs from ‘Giving Back to Profession’ are Twelve (30-18 = 12). 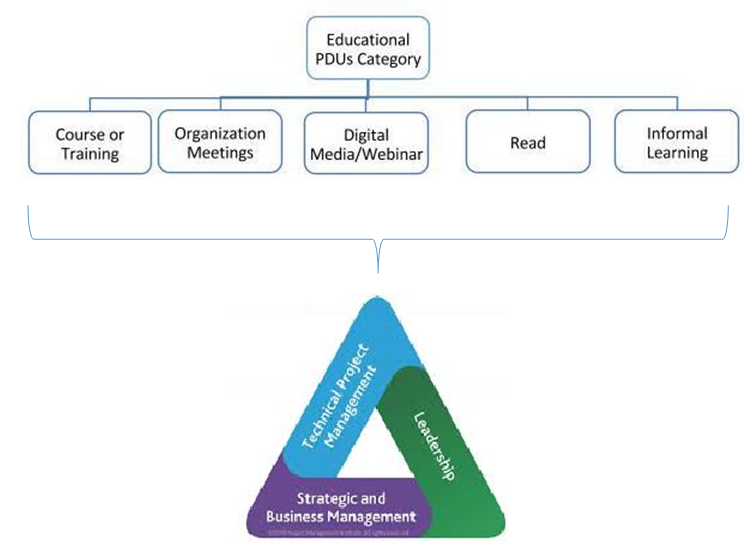 You have to earn at least four PDUs for “leadership” “technical” and Strategic categories of the Talent Triangle. You can earn remaining six (18 – (4 Leadership + 4 Technical + 4 Strategic)) across any area of the Talent Triangle. If you choose to earn PDUs from “Work as a Practitioner” from the ‘Giving Back to Profession”, you can earn maximum of four in one CCR cycle. You can choose to earn all thirty PDUs from any category of Education. Or by other third-party providers. Also give you chance of networking in your community. 4. Read: You can earn PDUs by reading materials including (but are not limited to) informational, non-fiction books, articles, white papers, or blogs. If you like reading to enhance your knowledge and skills this could be an interesting category for you. For more details, kindly refer my blog “How to report Read PDUs”. 5. Informal Learning: You can also earn PDUs by attending activities including (but are not limited to) mentoring sessions, panel discussions, lunch and learn sessions, or other structured discussions. PMI understand that attending mentoring sessions and panel discussions are good way to take your skills to the next level. Attend them and also grab the opportunity to earn PDUs. Work as a Practitioner: This is a sure kind of category. If you are working in as per the profession of your certificate, now the question is – how many PMI PDUs can I claim for working as a practitioner? The answer is, working as a Project Manager; you can report a maximum of 8 PDUs if you are PMP® (https://www.izenbridge.com/pmp/online-course/) certified. Give a Presentation: You can earn PDUs by presenting on topics relevant to the project management and/or business analysis depending on your certificate. You can speak in professional conferences, at a PMI chapter event, or within your organization.If you give presentation in project management or business analysis, the PDUs earned will be equal to the hours spent. If you also created the content of the presentation, then in the same claim, you can count any time spent preparing for the presentation in PDUs. Share Knowledge: Mentoring, teaching, coaching or applying your knowledge and subject matter expertise also give you opportunity to earn PDUs. Volunteer: You can earn PDUs by providing volunteer, non-compensated project management service to non-employer or non-client customer groups. Providing project management related volunteer services to PMI® or other professional project management association. Not every time you have to pay a hefty sum to earn PDUs, you can earn them for free. Yes, you read it right; Here are few ways to earn PDUs for free without spending a nickel. You can subscribe to our YouTube Channel. Watch videos on to earn PDUs under Category Online and Digital Media. You can also read a book on certificate topics and earn PDUs. Attend our Periodic Webinars and earn PDUs under ‘Online and Digital Media. You can club Earning PDUs with some next level certification you may like to think in near future. In this case, courses from REPs are best way to earn PDUs. In other words, ‘Read’, ‘Online and Digital Media’ and Course from REPS are easy and popular ways to earn PDUs. How to report ‘Read’ PDUs. How to report ‘Online and Digital’ PDUs. You should remember that renewal is not only collecting PDUs but also paying the renewal fee to PMI. Upon earning all these PDUs, PMI will send an email to renew and payments. A new CCR cycle starts after the renewal process. The renewal fee is different for member and non-member. I see a good number of test takers not renewing their membership after doing certificate. In case you are renewing your certificate, better to take one more advantage and save 90 USD. The renewal fee for member is 60 USD and nonmember is 150 USD. Also, many of you are unaware that they do not have to wait for complete CCR cycle to renew certificate. As you get required PDUs, you can pay the fee and renew it for next cycle. So, if you renew it in your exam year, you will get the renewal for six years. I hope this blog has answered your all queries related to ‘How to earn PDUs and maintain your PMI Certification’ during your professional career without spending much. If you have follow-up questions, kindly post them in the comment box provided. Do I need to be a member of PMI to keep my PMP? Answer: No, it is not needed. It is not necessary to be a member to keep PMP status. You can choose to be a PMI member to get discount in the renewal fee. The renewal fee for member is 60 USD and nonmember is 150 USD. You can claim this activity in the areas of technical project management and leadership. Answer: No, it is not needed. You can use the same credential which you use for pmi.org. Are the skill areas of the PMI Talent Triangle aligned with activities that Give Back to the Profession? Answer: No. Only education categories belong to the skill areas of talent triangle. 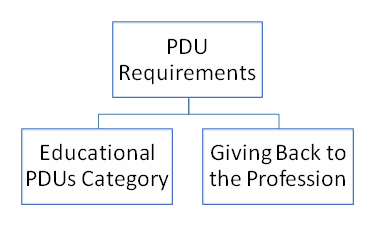 What are the minimum PDUs requirements for Giving Back to the Profession? Answer: Earning PDUs from ‘Giving Back’ to the profession is optional. There is no minimum PDU requirement for this category. How can I maintain several credentials at once? I attended an online and classroom training programme for 7 months with 5 days face-to-face classroom session. How much PDU can I claim for this? 1. You can earn rest of PDUs in Education Category, you do not have to earn all in Giving Back to Community section. Hi, I’m a PMP, have a question on how we can earn PDU’s for Giving Back section. In that category 8 hrs are minimum for work as practitioner and the rest 17 PDU’s are volunteering, giving presentations, or authoring the presentations etc. If we don’t actively work in the respective areas and are not part of any chapter for volunteering or does not have the opportunity to do presentations etc how can we earn PDU’s in that respective area. Please advise. This is how CCRS Guide Defines it. Each day, your work in a domain area related to your certification(s) allows you to apply your knowledge and skills in a practical setting. Using these competencies actively contributes to sustaining and growing the profession. So even if you are not working as PM , but doing things as per PM Role profile as per PMI, you can claim PDUs, In general you have so many ways to earn PDUs now, so you do not have to worry about this category much. I am a PMP. How can i earn “work as a practitioner” PDU, other than the way of working as PM for 3 years? Quoting a senario, maybe i change job after 1 year?